Kettle Moraine Correctional Institution is a medium security male prison located in Plymouth Wisconsin. This facility opened in 1962 with an operating capacity of 783, and currently houses 1,177 male inmates. This prison is secured by two twelve foot high razor wire fences, seven armed guard towers, and multiple electronic detection systems. Offenders who do not possess a high school diploma can take adult basic education courses and earn a GED during their incarceration. 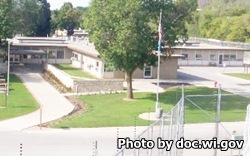 Vocational training at Kettle Moraine Correctional Institution includes custodial maintenance, auto detailing, computer aided drafting, cabinet making, welding, and masonry. Kettle Moraine Correctional Institution provides re-entry courses for inmates who are nearing their discharge date and want to be prepared for release. The re-entry courses cover the various challenges that will face an offender upon release including, healthcare, housing, transportation, wellness, personal development and employment. This facility also has a 16 week residential alcohol and substance abuse program inmates can take. Inmates participating in the substance abuse program are housed in Unit 15 together. Additional programs available are the Cognitive Intervention Program which aims to help change criminal behavioral patters, the Anger Management program which is based on the Cage Your Rage program, and domestic violence counseling. Medical, dental, and psychological services are provided to all inmates who require them. Visitation at Kelly Moraine Correctional Institution occurs on Mondays, Wednesdays, Thursdays, and Fridays from 3pm-8:30pm (can be a maximum of three hours in length), and on Saturdays, Sundays and Holidays from 8am-3:45pm (can be a maximum of two hours in length). General population inmates are allowed three visits per week, only one visit may be on a weekend and only one per day (week begins on a Wednesday and ends on a Monday). For more information on visiting read the Kettle Moraine Correctional Institution Visitors Guide.